As historian of the club I found it interesting to see how the CWR (California Western Railroad) operated up over Summit – the last big hill before you get to Willits. I also enjoyed watching how useful the Skunk train was to those who lived along the line from Fort Bragg to Willits. PS – Roger also added the sound. Posted in CWR General, CWR Railbuses. This map first appeared tucked away in the back of a Western Railroader. It was recently the subject of some correspondence I had with a gentleman who works for Jackson State Forest. Webmaster Roger Thornburn was in on the correspondence and used his magical computer skills to enhance the original. As historian for the club I should have been knowledgeable of the great detail on the map. 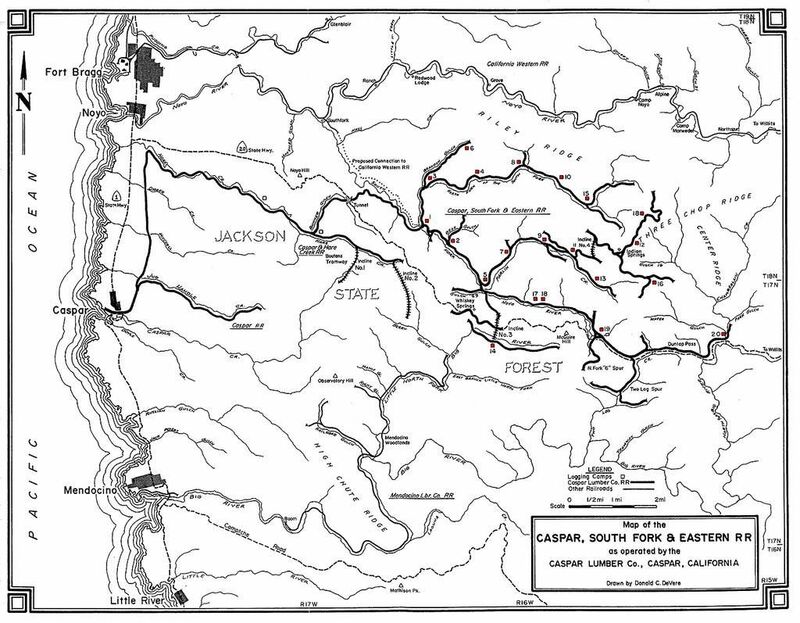 Not only does the map show the location of the Caspar Lumber Company’s twenty logging camps it also shows the location of its three inclines. 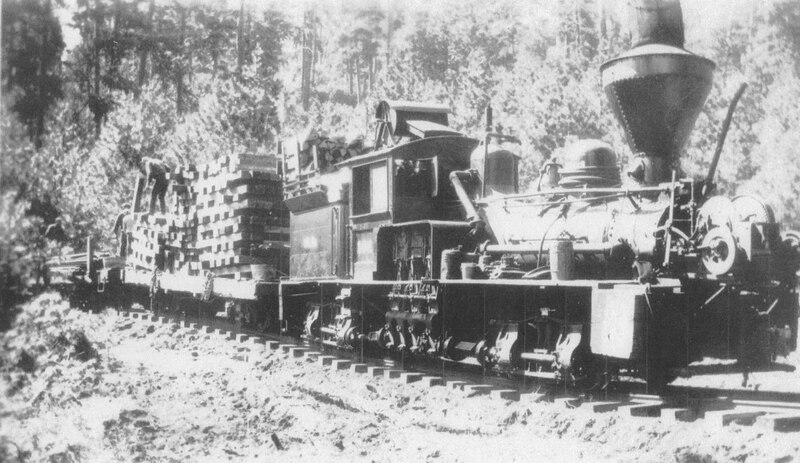 Not only do we get the Caspar Railroad the CWR’s railraod is shown as is the Mendocino Lumber Compamy’s railroad tracks. If that wasn’t enough you can see Route 20, Highway 1 and the Comptche Ukiah Road. 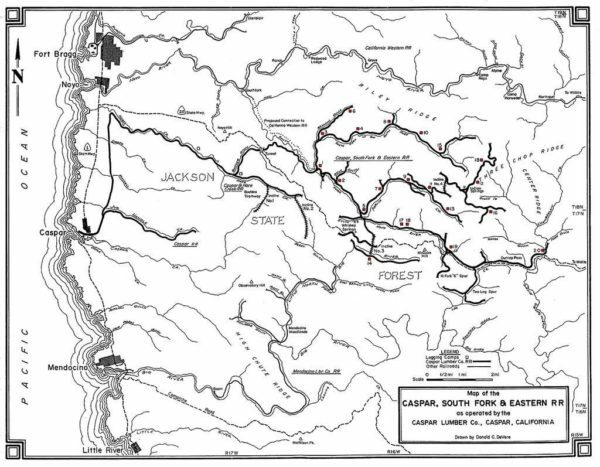 Last, but not least, it shows that the choice of path for all three railroads was along the side of rivers and streams. Have a gander for yourself. You’ll need to click on the map to see all the details I have described. Posted in CWR General, Fort Bragg, Maps, Mendocino Coast, CA , Local History. The name Irmulco comes from Ireland Murray Lumber Company. The company started out in 1902 with a small steam powered sawmill in Two Rock Valley, six miles west of Willits. Lonzo Irvine and Henry Muir ran this mill until 1909 when the supply of readily available timber was exhausted. The operation was moved along the Noyo River where it ran until 1923. 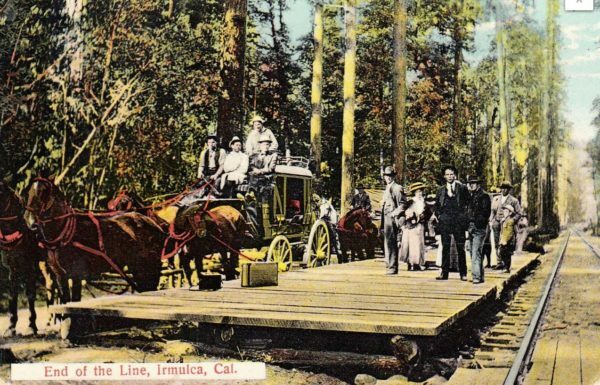 Prior to the line from Fort Bragg going all the way “over the hill” to Willits it ended at Irmulco. 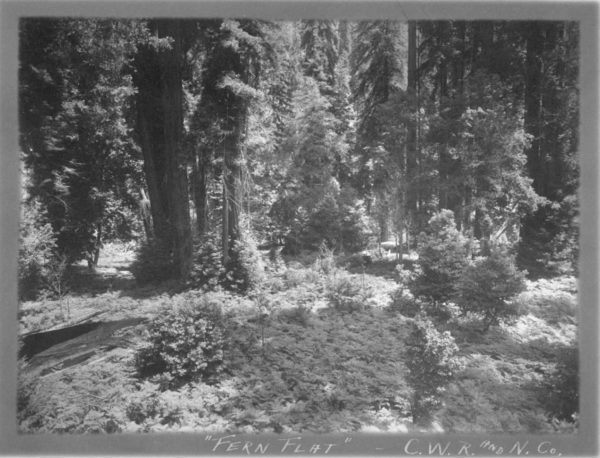 To travel the last sixteen miles to Willits passengers had to alight and catch a stage. Posted in CWR General, Towns. This is the only pic I have seen of track laying in the woods. Whilst this photo was taken in Oregon I can’t imagine it was much different along the Mendocino Coast. Nope, I don’t know where it was although my suspicion is that it was somewhere between Fort Bragg and Northspur. The originals were very poor quality sepia prints. I have converted them to grayscale and enhanced them. If anyone knows owt about where it is I’d appreciate knowing. 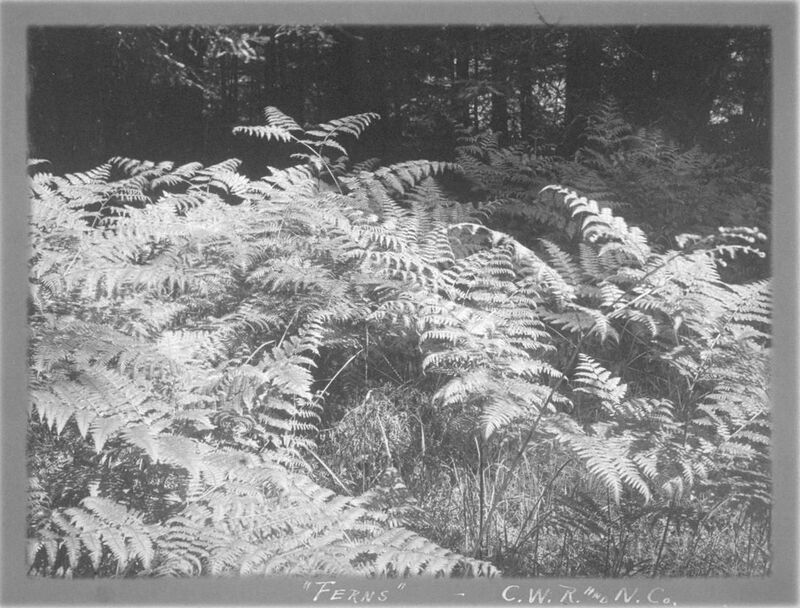 Crowley was 32.6 miles from Fort Bragg. It was the site of a logging camp owned by a French man. He had a love of tennis and imported clay to build a tennis court. 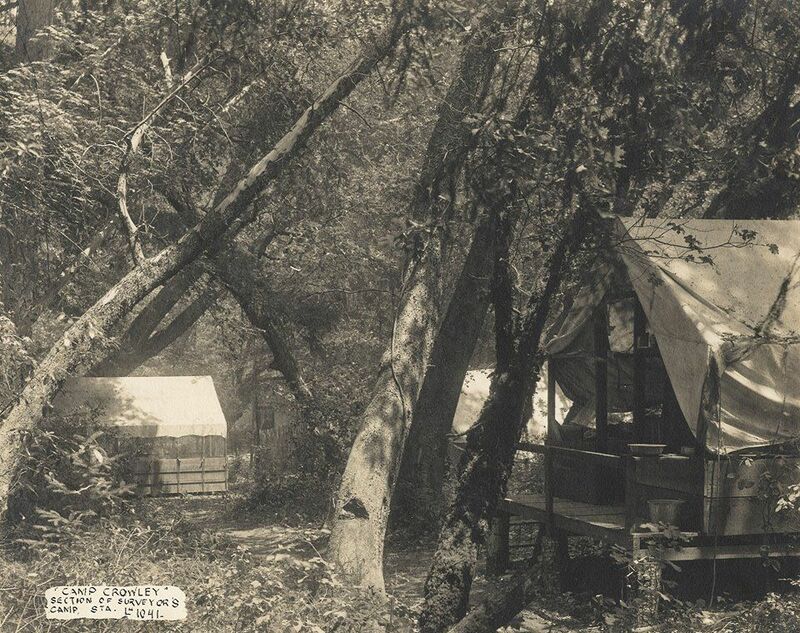 Until relatively recently the camp at Crowley was intact. It consisted of five bunkhouses, a mess hall and the foreman’s quarters. That’s all we know and heretofore NO pics. Well, this isn’t quite a pic of Crowley but it is a pic taken at Crowley. 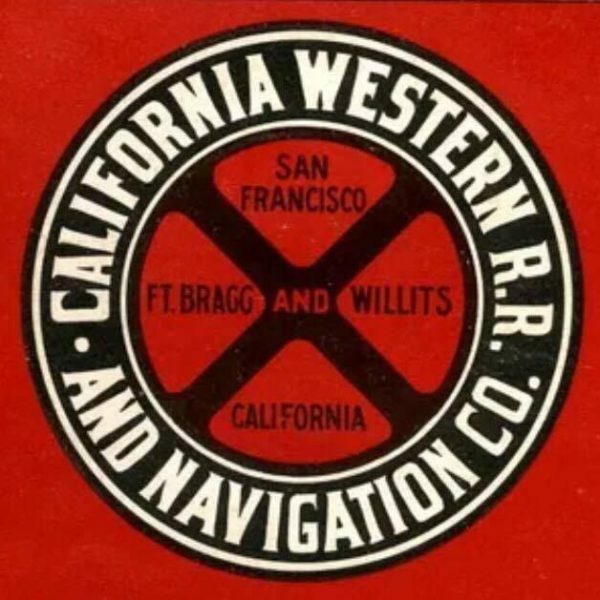 This was the original name of the CWR (California Western Railroad). The “& NAVIGATION COMPANY” was dropped on January 1st, 1948. And, this logo went away forever – well nearly until I found a pic of it!